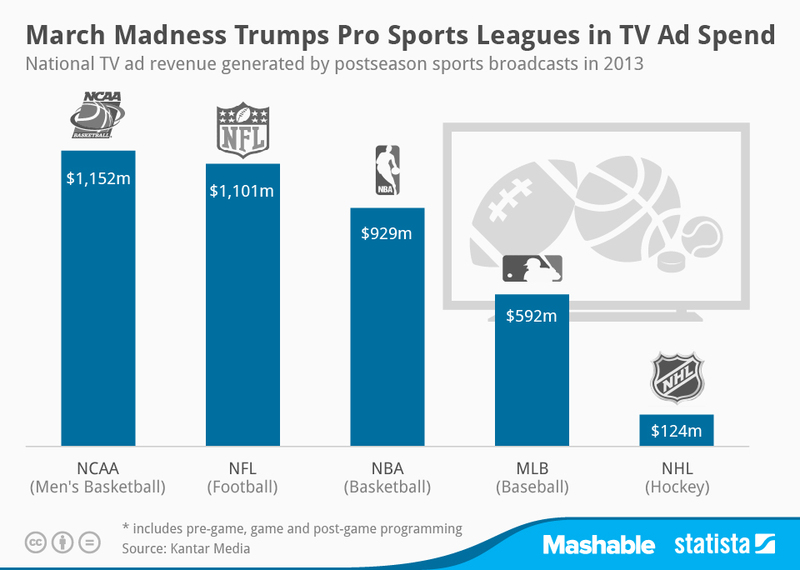 In regards to postseason television advertising spend, the NCAA Men’s Basketball Tournament generates $1.152 Billion, beating out the NFL, NBA, MLB, and NHL postseason tournaments. The chart below courtesy of Statista shows a graphic representation of the discrepancy between the professional sports leagues and the basketball tournament. Even among the professional leagues, it seems as if the NHL doesn’t belong in the conversation, which is unfortunate because yours truly is an avid hockey fan and the NHL playoffs are the most exciting postseason tournament around (biased opinion, of course). The NFL tops $1 Billion, which makes a lot of sense considering advertisers are willing to spend $3-4 million on television spots during the Super Bowl. The NBA is close to both the NCAA Men’s Basketball Tournament and the NFL, most likely due to the time period (~7-8 weeks) of the NBA playoffs and the popularity of big names such as Lebron James, Kevin Durant, Chris Paul, and more. Lastly, MLB reels in almost $600 Million, but there are far fewer games compared to the NBA and NHL playoffs, and the major ratings develop in the league championship series and World Series games. Do you think the increased spending during March Madness is justified for advertisers, or are they spending too much for a college basketball tournament?